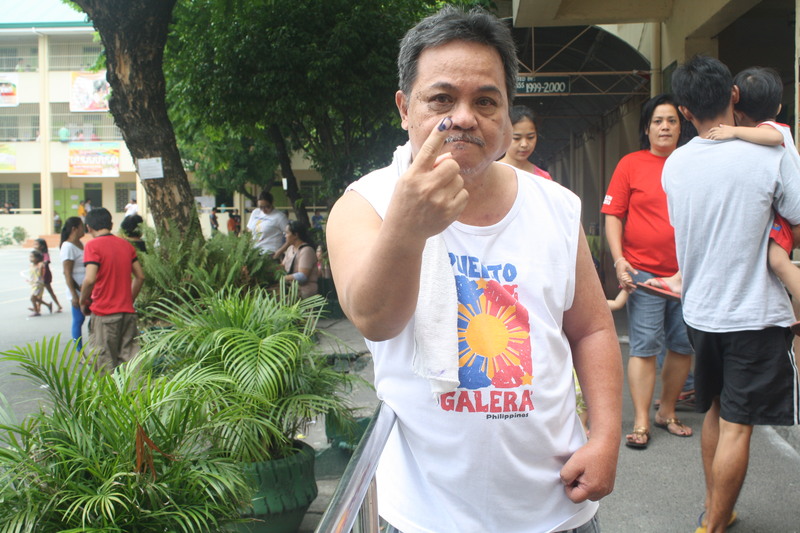 Despite having physical difficulties after suffering from stroke in 2009, Alfredo Labao remained determined to take part in yesterday’s elections. Accompanied by his wife Patricia, the 58-year-old resident of Sampaloc, Manila said he can’t let his chance to vote for his preferred candidates go away. The Labaos arrived at their polling precinct in Benito Legarda Elementary School (BLES) in mid-afternoon. “Ayaw naming makipag-siksikan,” Erlinda said. Upon arriving in the school’s main gate, volunteers from the Parish Pastoral Council for Responsible Voting (PPCRV) brought a wheelchair for Alfredo. The school has two wheelchair ramps on the ground. He, however refused their offer to help him all the way to his precinct located in the third floor. “Kaya na namin ng asawa ko umakyat,” he said. Members of the board of election inspectors in the city’s clustered precinct promptly facilitated his voting. As mandated by Commission on Election resolution 9640, persons with disabilities (pwdS), the elderly, and pregnant women, should be made to vote as soon as they enter the precinct. Alfredo proudly showed his purple index finger to Vera Files shortly after he finished voting. Jocelyn Rillon, the team leader of PPCRV volunteers in BLES, said their group has assisted about forty PWDs as of yesterday afternoon. They were assigned to the area by the Most Holy Trinity Parish in Balic-Balic, Manila. The group also has two deaf-mute volunteers that are specifically trained to attend to other PWDs, Clark Jaucian and Joyce Lubuguin. During the interview, Lubuguin demonstrated to Rillon the instructions she gave to PWD voters. In Ramon Magsaysay High School (RMHS), also in the fourth district of Manila, elderly voters and PWDs are allowed to vote in an express lane setup near the school’s quadrangle. According to Alma Tadina, the school principal, one member from the board of election inspectors in the precinct where the voter is registered is called downstairs to assist them in voting. Three senior citizens and a man who recently underwent a surgery were seen voting in the area when Vera Files visited RMHS Manila. In resolution 9485, the COMELEC ordered schools to put up accessible polling areas for PWD voters, preferably at the ground floor. PWDs registered to vote in Corazon Aquino Elementary School (CAES) in the second district of Quezon City however are not as lucky as their counterparts from Manila. The school does not have a readily-accessible area in the first floor where PWDs can vote. The ramp in the school building’s main entrance may make life easier for wheelchair bound voters, but it is not used. 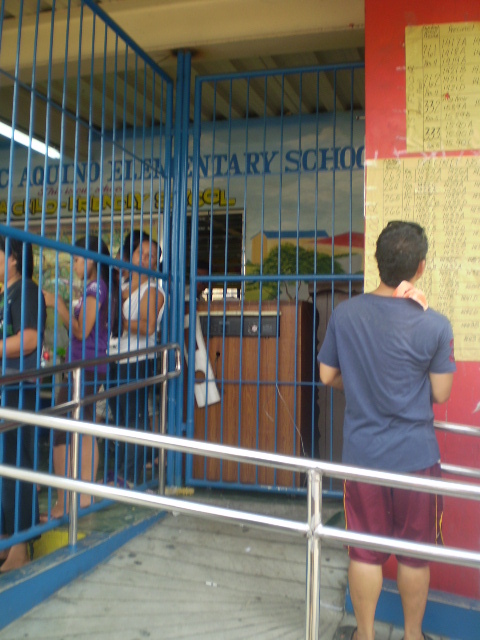 School postings meant for PWDs are placed in areas where it is not easily viewable. 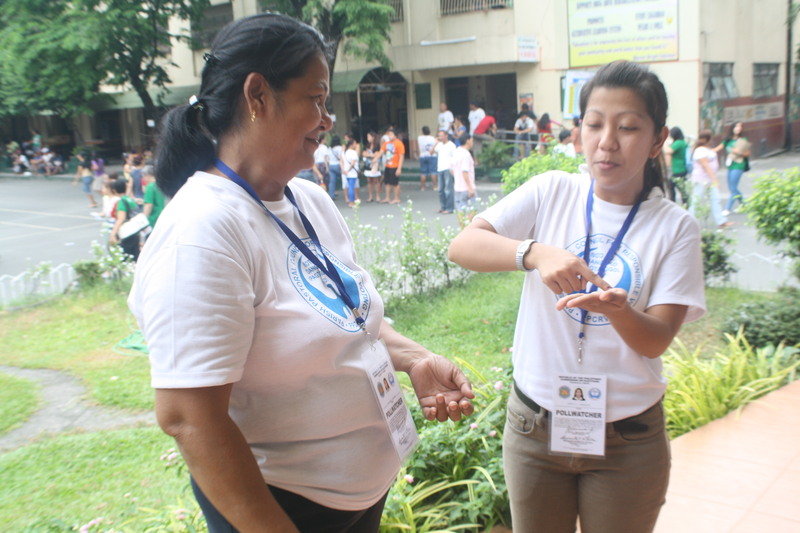 According to one COMELEC volunteer in the area, the most they can do for PWDs is to prioritize them during the voting. District II is the largest legislative district in Quezon City based on population.